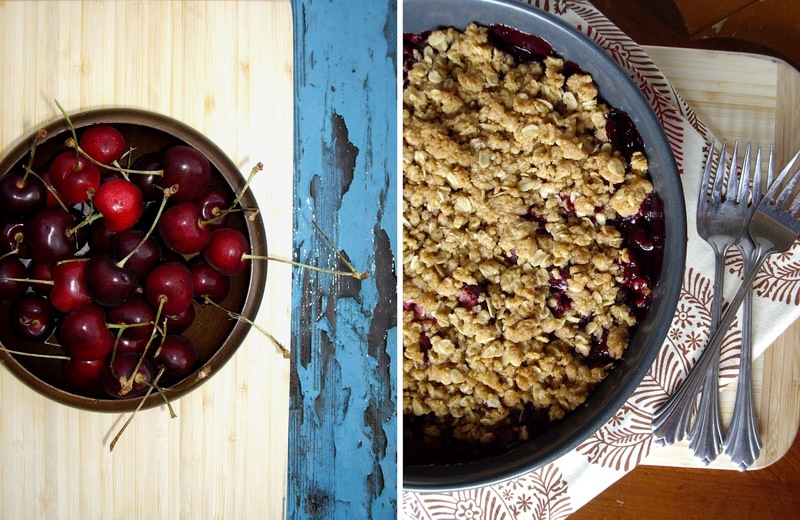 There's something so quintessentially summer about a big bowl of cherries. I love to keep one full on the kitchen table the whole season long. We snack on them throughout the day, and add them to salads, yogurt, ice cream, and cereal. And I have to tell you that my kids have become quite talented pit-spitters recently. I have a feeling that by next spring I will have a hundred cherry trees popping up all over the yard. 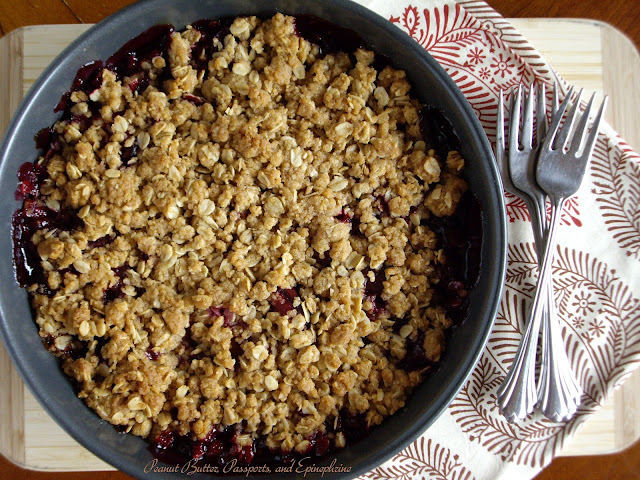 Sunny, tart, and lightly sweet, a fruit crisp is something else that forever embodies the bounty of summer. I have many fond memories of Summertime crisps, baked in the morning when the house is still cool and fresh, set on the windowsill to cool. Served with a large scoop of creamy vanilla ice cream, this Plum and Cherry Honey Crisp is perfect for a lazy summer evening spent with neighbors and friends on the front porch. 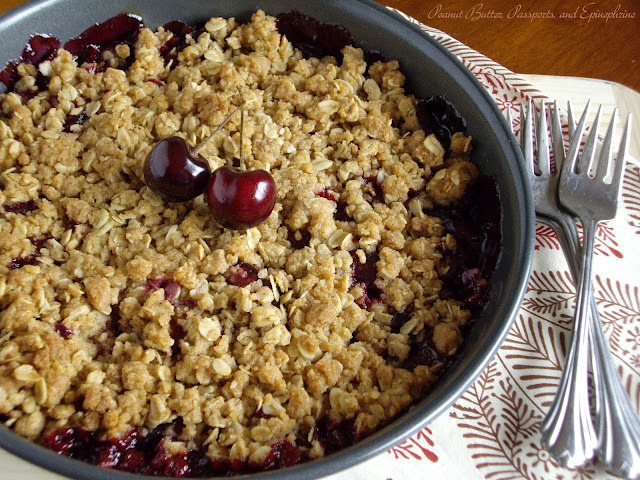 A typical cherry crisp contains almonds in the crunchy topping - a classic flavour that I miss dearly. Since this is nut-free, I wanted to create a topping that is extra crispy, as a way to somewhat imitate the nutty texture that the almonds would have added. I did this by using coarse grain Turbinado sugar in place of the brown sugar. The large sugar granules give it a unique and delightful crunch. The filling is flavoured with luscious honey and delicate vanilla. I call this a Honey Crisp because the honey is a dominant flavour, so choose one that you really like. I prefer a mild, sweet clover or orange blossom honey, but if you just love a robust wildflower honey, by all means use it. Just know that the flavour will intensify as it bakes. I imagine that Agave Nectar would work wonderfully in here, as well, though I haven't yet tried it. All in all, fruit crisps are extremely versatile and forgiving, so get creative and add what you like. Just be sure to share it with the ones you love! Preheat your oven to 375 F (190 C). Cut the plums into bite size wedges and place in a large bowl. 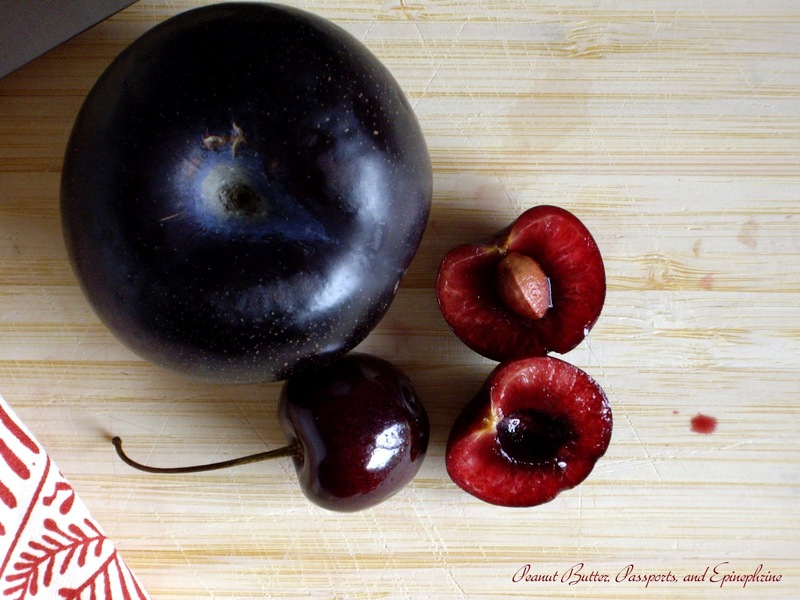 Cut each cherry in half, remove the pit, and place in the bowl with the plums. Add the honey, cornstarch, and vanilla and toss. Set aside while you prepare the topping. In another bowl mix the dry ingredients for the topping. Pour in the butter and mix until combined. Pour the fruit into an 8 inch round or square baking dish. With your fingers, crumble the topping evenly on top of the fruit. Press down lightly. Bake in the preheated oven for 30 to 40 minutes, until the topping is golden and crispy, and the fruit is bubbly. Serve warm or at room temperature with a scoop of vanilla ice cream or freshly whipped cream. This recipe is absolutely gorgeous! Your pictures are stunning. This just screams summer. I always have to ration ours if I'm planning on cooking with them. Otherwise they disappear as soon as I bring them home. Thanks, Me and My Sweets! I'm heading over to check it out now. Your Crisp looks awesome! Hope you have a fantastic week and thank you so much for sharing with Full Plate Thursday. Thanks, Miz Helen! Have a wonderful week, too! All 4 of my plum trees are producing fruit this year, so I am bookmarking this recipe for when they are ripe. Oh, I'm jealous. I grew up around plum trees, but don't have any now. I wish I did!